Final Veil will wrap up 2011 with the production “Cairo Cabaret,” a show featuring an amazing line up of the most celebrated bellydancers from around town (and from up north!) at a swanky new supper club and theater in Maplewood called Jumpin’ Jupiter on Friday, December 9th. 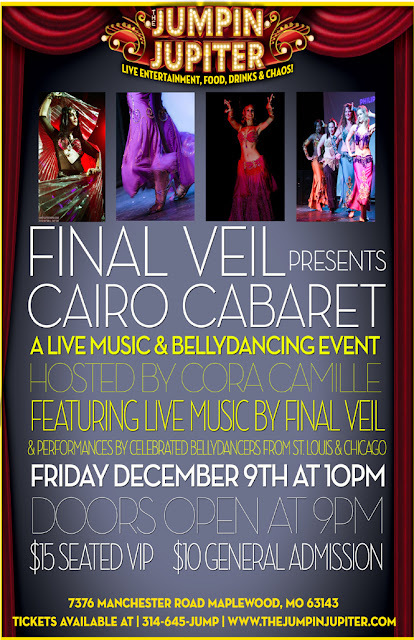 Hosted by Cora Camille, the show will feature live music by Final Veil and a wide variety of bellydance troupes and soloists ranging from gorgeous cabaret dancers to mysterious and hypnotic tribal dancers. Guests will delight in the accompanying light show and full experience that harkens back to the age of cabaret and fine entertainment for your sophisticated soul. This will be a rare showcase not to be missed! Doors at 9pm, show at 10pm, VIP seated tickets $15, general admission $10. Limited tickets available, be sure to reserve your ticket in advance by following the link here.